The titular character, Warren Schmidt (Jack Nicholson), is at an end-of-life crisis. After retiring, he enters the twilight years with cynicism and boredom. His wife is aging quickly, and Schmidt often wonders where the woman that he married has gone. His daughter (Hope Davis) is marrying a dimwitted guy who sports a mullet (Dermot Mulroney). Despite his best attempts, he can’t get her to reconsider. In all aspects of life, Schmidt feels useless. But soon Schmidt is left alone, and he decides to recapture control of his life by driving a Winnebago to see sights from his childhood en route to the wedding. Even after logging all these miles, he still can’t escape the feeling that his life is inconsequential. “About Schmidt” is at its best whenever it shows Schmidt trying to make a difference in someone’s life. After seeing an ad on TV, he decides to sponsor a child in Tanzania named Ndugu. He can’t pronounce the name, but Schmidt earnestly wants to help this child. He goes further beyond providing monetary support and makes contact with Ndugu, writing him many revealing letters about his own life. It’s somewhat pathetic to think that Schmidt can only tell these things to Ndugu, but it further reveals how lost this man is. It’s easy to see how movies like this have influenced Jason Reitman (for example, the wedding scenes in this and “Up in the Air”) and other directors, and “About Schmidt” is a movie that deserves to be imitated. Jack Nicholson gives no doubt as to why he is one of the best – if not the best – actors of our time. The supporting performances are great as well, particularly Kathy Bates as Schmidt’s overbearing future in-law. The Golden Globes classify this as a drama, and in large part, that’s what it is. 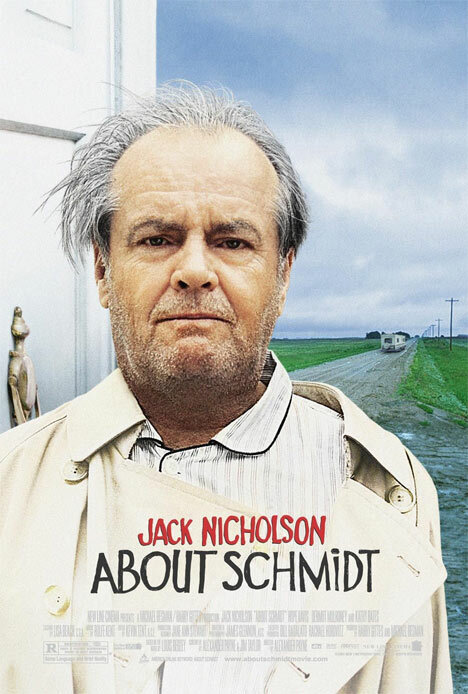 But “About Schmidt” has enough laughs to satisfy any moviewatching mood you could possibly be in. I used to work for Hollywood Video. When A.S. came out, I recommended it to so many people. That is, until all of those people came back and screamed at me. I guess it’s not for everyone, haha. And I probably should have warned them about the hot tub scene. Tarantino used to work at a video store … so this just shot you up in my estimation. This film is at times hilariously funny as anything, but then tear-jerking tragic so many times. I loved this film from start to finish, and thought that Nicholson handled this performance very well. I miss Payne, he is such a good director. I have a feeling Hollywood is going to need him back sooner or later. He’s back! “The Expendables” is coming out next year, starring George Clooney. He did work at a video store. Within my first year there, I rented over 1,000 movies (for free, of course). But that meant at least three rentals a day, every day. I was proud.